Whenever I am scarce on library books, I browse authors I’ve read before – to see if I’ve missed a publication. Elinor Lipman is one of my favorites. The Inn at Lake Devine is one I could read again, and My Latest Grievance, set on a college campus, and reminiscent of the insider’s gossip that could derail a stuffy professor’s career, was one of her best. Now I discover she’s written another – The Family Man. How can a gay, retired lawyer reignite a relationship with the two women in his life that he has avoided for twenty-five years? His opportunist ex-wife, Denise, whose most recent husband died and left her out of his will, sets him up on dates, and his long-lost daughter, Thalia, seems to have found a gold-mine in him. Henry is bound to be taken, but Henry is happy to cooperate. In this lively and humorous comedy of manners, Lipman has her characters juggling loves, careers, and relationships. Thalia signs a public relations contract to act as a failing movie star’s girlfriend, and moves into Henry’s downstairs empty maisonette. Henry finds his soul mate in a Jewish furniture salesman, and Denise paints her walls black to keep her exclusive apartment from being sold by her dead husband’s sons. The action takes on a Marx Brothers aura at times. More sophisticated than a Sophie Kinsella book – with the droll humor of Oscar Wilde – Lipman keeps her characters’ dialogue snappy and the New York setting authentic. And Lipman slyly slips in her views on the foolishness and bias of people, as she does in all her books. By the end, it all sounded familiar; could it be I read it when it first came out and forgot? Wouldn’t be the first time – still an enjoyable read. 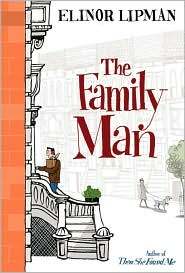 The Family Man was published in 2009; isn’t it time for another? This entry was posted in authors, book review, books, humor, reading and tagged author of Inn at Lake Devine, books, Elinor Lipman, Inn at Lake Devine, Lipman, My Latest Grievance, The Family Man. Bookmark the permalink. I’ve certainly picked up a book by a familiar author thinking I’d missed reading one and then half way through realized that I’d already read it!! I’m still not sure if I’ve read this one before, but I enjoyed reading anyway.